Black Raison d'etre - Secret Survivor (short size) · forums · community | osu! if you use original, artist is too long. Last edited by Asuka_- December 26, 2017 at 9:20:32 AM GMT , edited 6 times in total. 00:35:195 (4,1) - Do not you want to make a blanket better? I think od 5 for normal it's hard, maybe do 3-4? 00:20:718 - imo You can add a slider here. He's good at music here. 00:21:764 (3) - not really, I understand the meaning of this note, it does not sound like music at all, only on vocals, but it's still badly played! Can I just extend the slider until now? 00:46:880 (1) - It's the same here, but is it better to move this note 00:47:055 - here or 00:47:404 - here? 00:03:799 (2,3,4) - I consider that such a rhythm expresses the given moment better! 01:06:066 (1,2,3,4) - imo This pattern looks very stupid, can it try something like that? Last edited by makisokk November 23, 2017 at 9:43:00 PM GMT , edited 3 times in total. This mod will be hitsound mod, because i believe to your rhythms and patterns except Insane difficulty, which should be renamed to Extra due to large amount of jumps or specific slider usage like 00:16:008 (1,2,3). Easy has inconsistent kiai with other difficulties. Remove it from right greenline. 01:25:427 (1) - Hey, this spinner has unrankable recovery time. You need at least 1/1 beat gap between end of spinner and next object, but here is only 1/4 gap. I'm not able to jugde this difficulty, because i feel this is rather kind of Extra than Insane. 00:10:427 (1,2) vs 00:11:822 (1,2) vs 00:13:218 (1,2) - why are the distances changing from object 1 to 2 for each pair? 00:26:648 - too blank, so what about use a 1/1 slider to instead this circle? 00:35:020 (9,10) - what about a 1/2 reverse slider? Last edited by Asuka_- November 25, 2017 at 11:40:35 AM GMT , edited 2 times in total. 00:45:311 (3,4) - curves here might be angled too much try https://osu.ppy.sh/ss/9610505 hmm? 00:20:718 - add circle slider better! 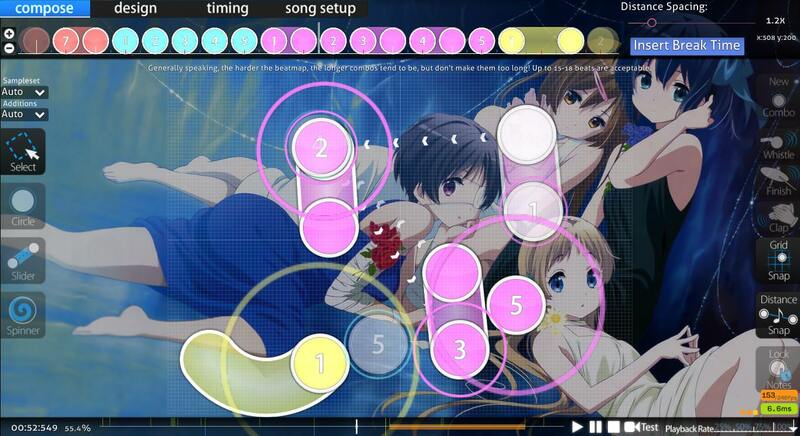 01:03:101 - i feel sad nothing mapped here, but its ok maybe to prevent overmap not overmap. 00:34:497 (7,8) - Have these 2 be further from 6 as spacing has changed by then. 01:29:787 (1) - Think about using a slider instead of a spinner. 00:27:171 (5) - This should be the new combo as putting it where it is now is really disorienting. 01:13:218 (1) - There is no sound here, except for the sound that started in the previous red tick. 00:05:369 (6,7) - this 1/1 gap looks uneven little bit imo. Players can read it as 1/2 gap because you made big jumps at 00:04:497 (1,2,3,4,5) - getting bigger DS, I suggest you can make easier pattern for reading. 00:15:921 - How about adding a beat here? you used 1/4 gaps at 00:14:613 (1,1,1,1,1) - and 00:15:921 - this empty beats looks little bit weird for me imo. 00:29:962 (1,1,1,1) - not a major issue, you can make blanket patterns at here for better visual of patterns. 00:35:020 (1) - Unnecessary NC since you didn't add NC at 00:24:032 (4) - , for consistency, I think you should delete NC. 01:29:787 - I think you can add a beat here, has same drum sound with 01:29:090 (1,2) - , so adding beat can help for better drum sound expression. 00:29:962 (1) - ctrl G, you have jump at 00:30:834 (2,2,2) - here, then you can make similar intense with them for consistency of expressions. 00:39:206 (5,6) - check slidertails each, they have linear overlap, it looks ugly little bit. avoid overlap for better visual. 00:56:822 (7,1) - I think you intended blanket, but it has little bit nazi, try to make better blanket. 01:09:032 (1,2,3,4) - this part has really high intense,. so you can make this pattern with bigger DS, for better expressions. 01:25:427 (1) - you didn't add spinner at here in other diffs, it looks really weird since this is not so good for consistency of diffs and it doesn't fit with songs. I think you can make this rhythm like this. 01:29:090 (3) - this part has strong drums, so Unstacking looks better for expressions. 00:03:276 (5,6) - in this part, you followed vocals. but you followed drum only this part, it is not so good imo. You should follow vocals like this or this. 00:29:962 (1,2,3,4,5) - in this song's section, this part has the lowest intense in here, but here has difficult pattern, I think you should make this pattern easier like this. 00:25:427 - add a circle here? because of a drumbeat i want to keep. in this map and diff, i dont want to follow drum in calm part. 01:18:625 (4) - 01:21:415 -00:15:660 - finish?